Atlanta's undead this time of year. Telltale just concluded its critically acclaimed The Walking Dead point-and-click adventure, and thankfully, players won't experience downtime before the next video game adaptation of the award-winning franchise, as Skybound and Gamagio's The Walking Dead: Assault just shambled onto the App Store. This title directly ties into Robert Kirkman's comic book series, following characters Rick, Shane and other familiar faces as they struggle to make it out of walker-filled Atlanta. It's a vastly different experience that spotlights squad-based play from a top-down perspective. Some quirks get in the way, but for the most part, fans will hunger for more. Story wise, The Walking Dead: Assault picks up from the initial comic's first pages, with Rick waking up alone and confused in the hospital. From there, he wanders outside, only to discover the undead apocalypse is in full swing. The developers take this opportunity to teach players the basics, which work quite well. Press and hold the screen to instruct Rick to move to a specific location, pick up supplies/ammo along the way and slaughter flesh eating monsters by carefully putting him within range, whereupon which he auto attacks the nearest zombie. Things get more complex, of course. Ammo is scarce, forcing players to conserve it whenever possible (a melee weapon proves useful in this case), and guns make too much noise, thereby attracting a horde of creatures. What ensues is a careful balancing act between rushing in blowing off heads and taking a more intelligent approach. 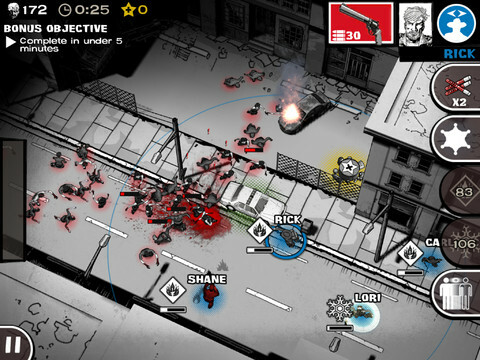 For the latter, Skybound litters environments with decoys designed to attract a zombie's attention, from car alarms to busted fire hydrants and other things in between, giving users the chance to pick off enemies from much safer distances. Being a squad-based dungeon crawler means recruiting characters to join the cause, opening the door to beating missions with a well-armed group. The developers took this opportunity to make each survivor unique, adding more depth to the game. Rick, for example, possesses a special move where he scores guaranteed headshots while providing a team leadership bonus that boosts everyone's accuracy. Glenn, conversely, uses himself as bait to distract Walkers, while also increasing the team's speed. With nine available characters (for now) and only four max slots per mission, players must choose the best people for the job; gamers can also upgrade various attributes, like health, overall damage and ammo. On top of that, the game's art style closely mirrors the comics' black and white pages. There's no shortage of bleak-looking scenery. What's more, shooting a zombie always results in a red streak of blood splattering against the pavement. 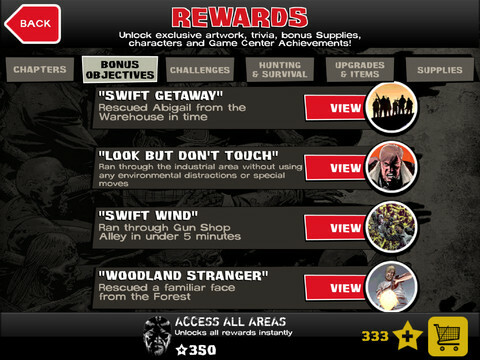 Our praise notwithstanding, The Walking Dead: Assault is a bit on the slow side, which conflicts with the feature that challenges players to complete levels as quickly as possible to beat friends/rivals' scores. More often than not, users just sit there watching as the team plods along. Finally, both the audio and visuals lack sharpness. 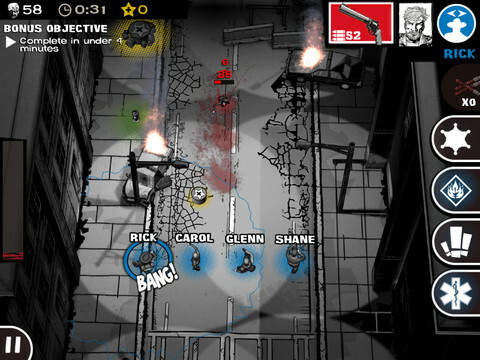 Skybound claims that the game was optimized for the iPhone 5 Retina Display, but on the third generation iPad, it appears to suffer from low resolution. Same deal with the slightly muffled sound effects and music. Taken as a whole, The Walking Dead: Assault provides a welcome change of pace from the usual first and third person zombie shooters, with smartly designed squad-based mechanics. With more chapters due for release in the coming months, it's a game worth hanging on to, especially if you love the comics and/or TV show. What's Hot: Enjoyable squad-based play, follows Robert Kirkman's series, black and white graphics with splashes of color, characters possess different special moves and team bonuses, easy access to buy downloadable comics, unlocked artwork. What's Not: Characters are a bit on the slow side, graphics don't seem to take full advantage of the iPad's Retina display, lackluster audio quality.